This post is sponsored by ReganMillerJones, Inc and the General Mills Bell Institute of Health and Nutrition on behalf of Progresso™. Soup’s on! 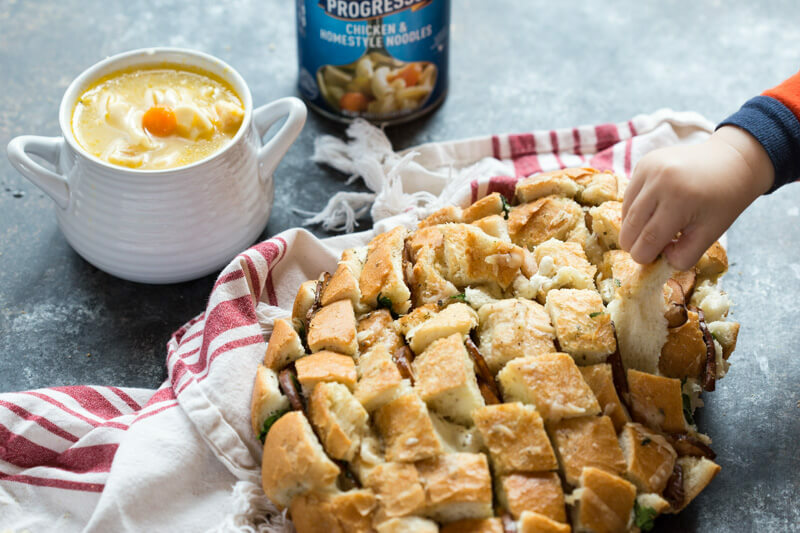 It’s officially soup season and what better way to celebrate than Cheesy Pull Apart Bread to dunk into your favorite soup. Can I get an AMEN?! 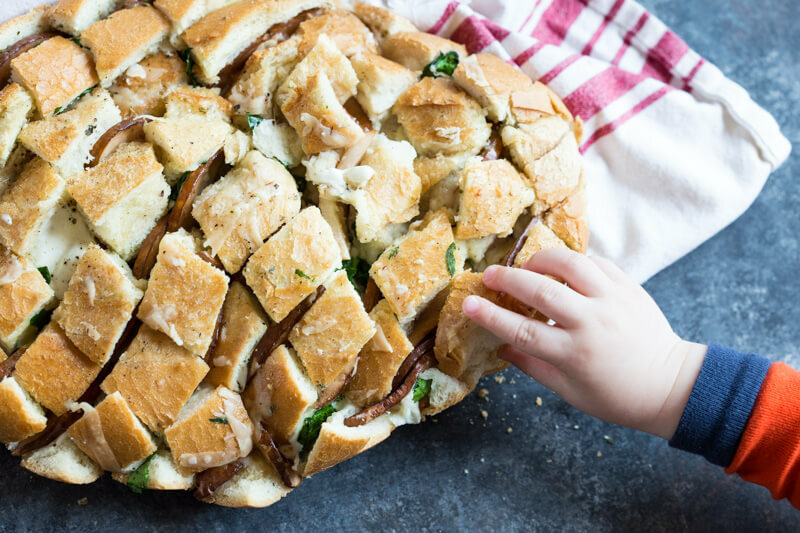 Melted cheese… sourdough bread… and finger food that’s good for a crowd or a party of one (or two)… and even little munchkin fingers LOVE Cheesy Pull Apart Bread. Do you make pull apart bread at home?? If not, it’s time to start. It’s pretty easy to prep.. just slice sourdough bread into a crisscross pattern and stuff it with your favorites before popping it in the oven. 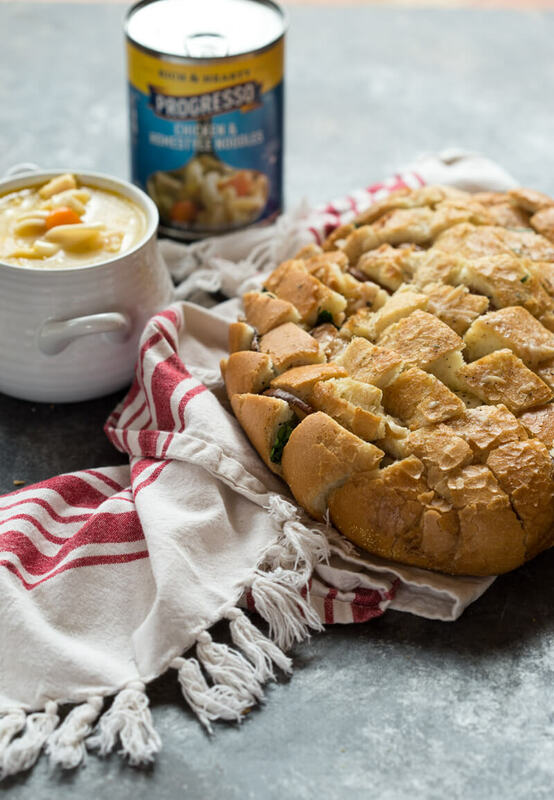 See what I mean… you need this cheesy pull apart bread in your life. Did you know that research shows that eating soup before a meal can help you feel full and eat less at that meal. Soup’s what’s up. Progresso™ is now serving white meat chicken with no antibiotics. ever. 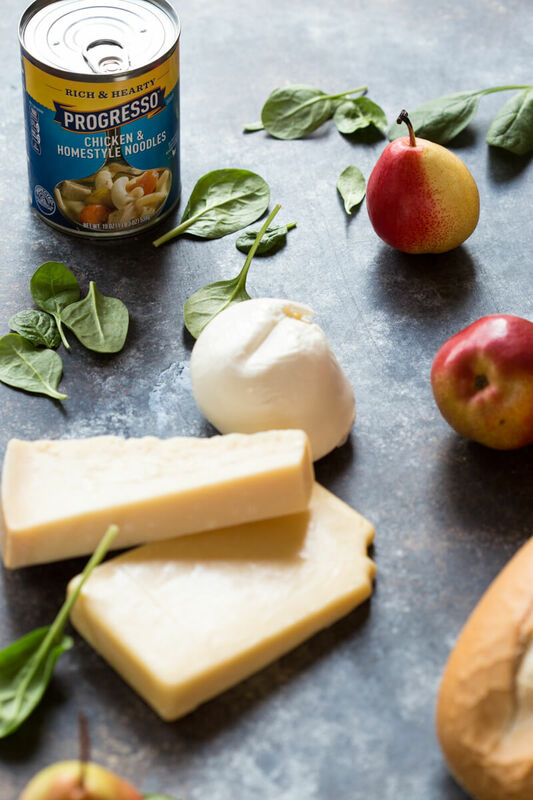 I love how quick and easy soup can be– you really can’t beat the convenience in a can. Talk about meal prep in minutes! What do you like to eat with soup? Simply hit reply to this email or leave a comment on the blog! I’d love hearing from you! This Cheesy Pull Apart Bread will serve a crowd or simply scale the recipe down for one or two. 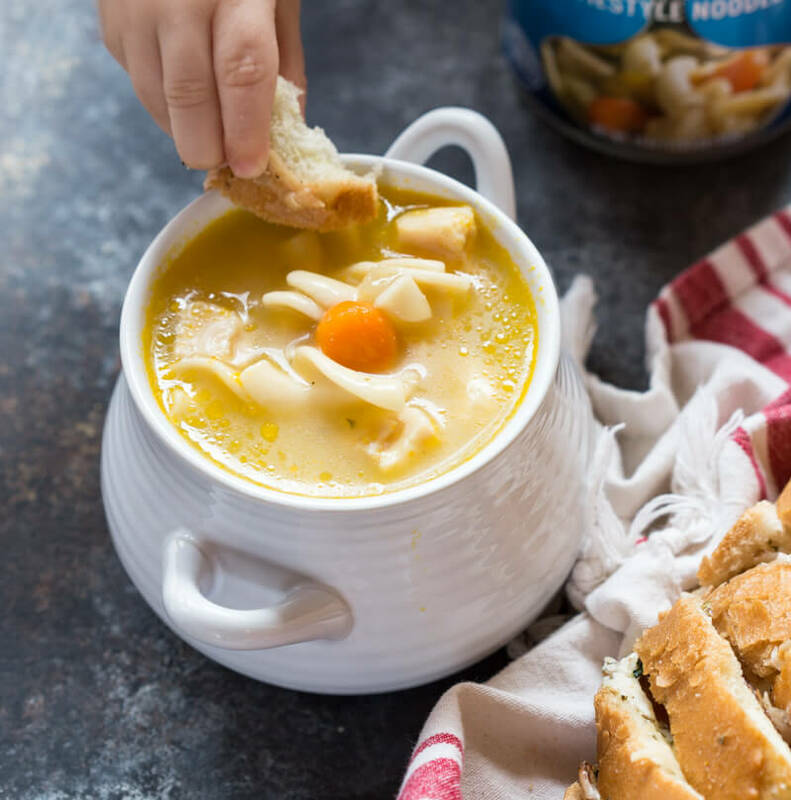 It’s easy to make and tastes delicious with soup! Using a serrated knife, slice bread on the diagonal, taking care not to cut all the way through the bread. Slice bread in the opposite direction on the diagonal to make a crisscross pattern in the bread. Place bread on a baking sheet lined with aluminum foil. Pour 2 tablespoons of melted butter into the bread. Stuff bread with spinach, mozzarella, cheddar cheese, pears and shredded parmesean. Sprinkle freshly ground pepper and Italian seasoning over bread. Pour remaining 1 tablespoon of butter and 1/4 cup vegetable broth over the bread. Cover top of bread with aluminum foil and connect with bottom sheet of aluminum foil to keep all steam inside the bread as it cooks. Bake for 15 minutes covered, uncover and bake for additional 10 minutes. Wow. This pull apart bread is very easy. Like that it is very cheesy too. 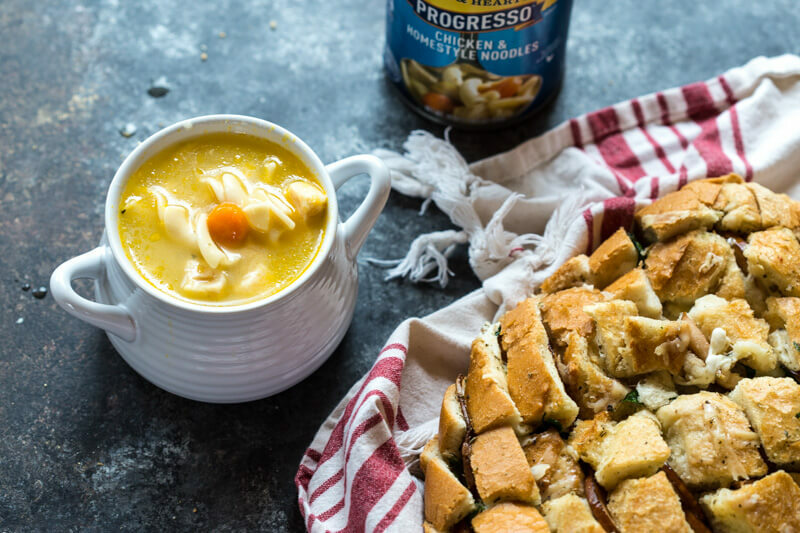 Cheese, bread, and soup, a trifecta of perfection! #SouperBowl goals! Looks divine and a perfect accompaniment to soup! This bread wouldn’t last 5 minutes in our house!! Looks AMAZING! Omg I’m totally making this soon! Love it!! Oh LORD this looks so good! And your photos are beautiful 🙂 Pinned! I’m allllll about soup dunking, so this is right up my alley! This bread looks fantastic – I love the addition of pear! 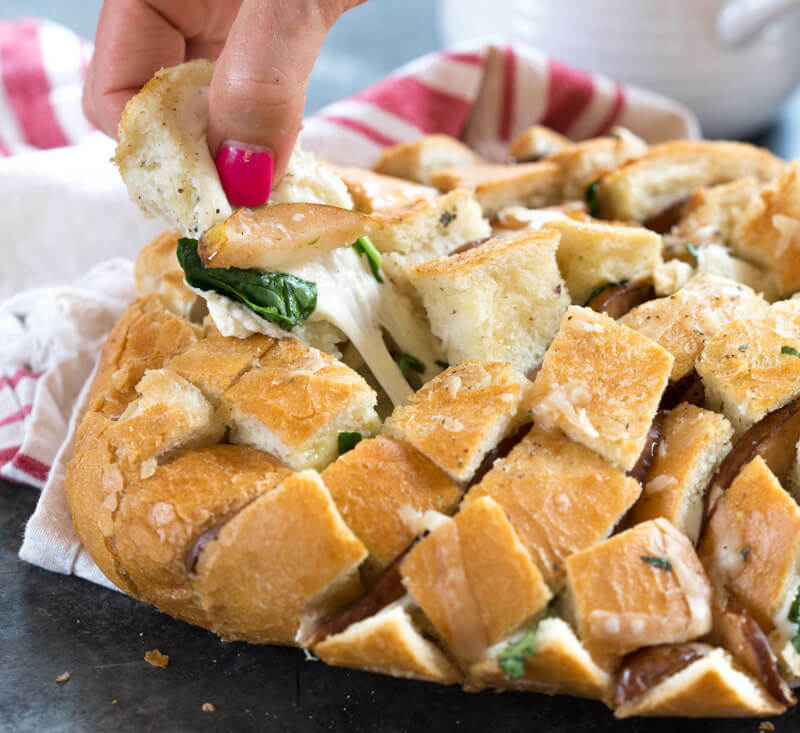 I definitely need this cheesy pull apart bread in my life! What a flavourful recipe – real comfort food! I like that it has spinach and pear too. 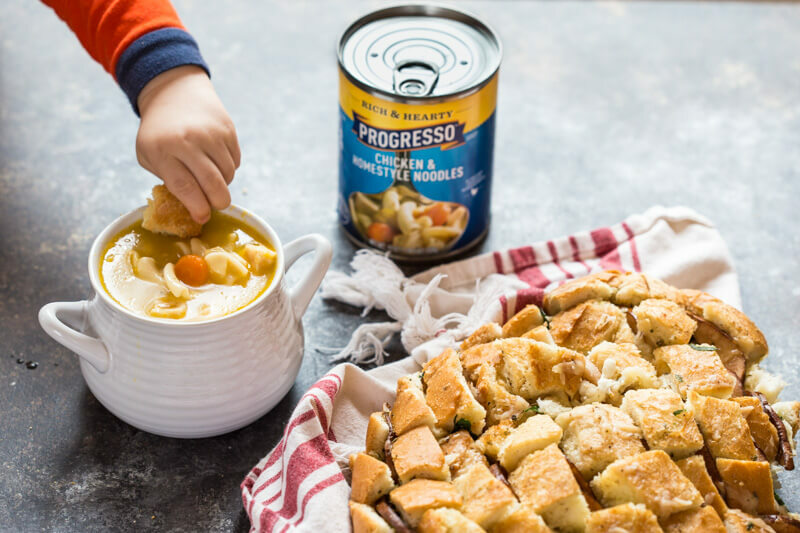 The soup looks wonderful too – you really can’t beat the convenience of Progreso soups! When I was growing up, I loved to eat either peanut butter and jelly dunked in my soup, or tuna fish! Now, I just eat a piece of bread with soup. This pull apart bread looks fabulous!! OMG this looks heavenly!! So much cheesy, melty, ooeey goodness1 what more can you want? !